The Espa at The Ritz Carlton Hotel is quite simply one of the best spas in Ireland right now and a sweet alternative to shopping! Set in the stunningly beautiful Powerscourt Estate, County Wicklow, this peaceful haven is very accessible being so close to Dublin. It is perfect for a romantic weekend escape or a day break with your girlfriends. If you cant get to Dublin there are plenty of other spas around Ireland doing similar offers, see list below. Created on the back of the celtic tiger to get rid of some of the excess pounds piled on in the good old days....These establishments are suffering now belts having been automatically tightened with the global recession. Which means great deals for anyone out there still able to afford a little pampering. Gone are the days when you would have to book weeks ahead to get fitted in for a facial? See the directory below for great deals and discounts. 1 The Ritz Calton Espa Powerscourt, County Wicklow. 2 Bellinter House the Bath House, County Meath. 3 The G Hotel Espa Galway city, County Galway. 4 Carton House County Kildare. 5 The Ice House Ballina, County Mayo. 6 Delphi Mountain Resort Spa County Mayo. 7 Doonbeg Lodge Wild Horses Spa, County Clare. 8 Monart Destination Spa County Wexford. 9 Castlemartyr Hotel & Spa County Cork. 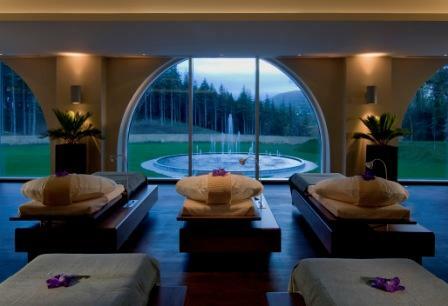 10 The Park Hotel Samas Spa County Kerry. For more information on Irish Spas please click here.